Kerr was not only the Queen’s man, he had long-standing ties to Anglo-American intelligence. He was an enthusiastic member of the Australian Association for Cultural Freedom, described by Jonathan Kwitny of the Wall Street Journal in his book, ‘The Crimes of Patriots’, as, “an elite, invitation-only group… exposed in Congress as being founded, funded and generally run by the CIA”. The CIA “paid for Kerr’s travel, built his prestige… Kerr continued to go to the CIA for money”. On 11 November – the day Whitlam was to inform Parliament about the secret CIA presence in Australia – he was summoned by Kerr. Invoking archaic vice-regal “reserve powers”, Kerr sacked the democratically elected prime minister. 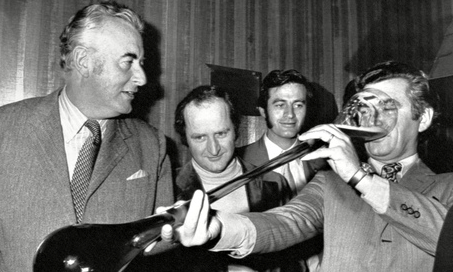 The “Whitlam problem” was solved, and Australian politics never recovered, nor the nation its true independence. The coup is also discussed in an excellent five-part American series on their state within a state – ‘Counter-intelligence’ – from thirty minutes into Part 1. This entry was tagged 1975 coup, Australia-US relations, Australian Association for Cultural Freedom, CIA, Gough Whitlam, Home on the Range, John Kerr, John Pilger, Malcolm Fraser - Kerr's cur, Marshall Green, Pine Gap. Bookmark the permalink.